Knowing that “Mothers”, produced by Joy Roberts from Improvising Change was a play bringing together the works of twelve writers and five directors telling the stories of nine different women, I wondered whether I was going to find it difficult to engage with the play as a whole. Thankfully the clever direction and production team have managed to make these nine very different stories flow into one coherent piece of theatre in which I, as a Mother was able to relate in some way to each of the women and their stories. While some of the stories stood out more than others, I was delighted with the sense I was left with of how easily this could represent any typical Mothers Group gathering, or even more to the point, any group of different women coming together to discuss their own experiences. I particularly liked the running date and time on the screen in the left corner of the stage as it provides a break in eye line for the audience, which I felt was needed as some of the scenes can become quite intense. The clock really gives you the feeling of moving through time and brought together the different stories as it allowed you a peep into each woman’s life at different times of the day. The very basic stage scenery and minimal props work so well in this production as it’s really the women that you want to focus on. When that focus is so important, it’s even more crucial that your actors are bang on with their bodies and faces to allow you to be with them in that moment. This being a play of monologues in such an intimate setting, the actors are exposed in such a way as to allow no room for poor or over-acting and thankfully this wonderful cast didn’t leave me with any cringe worthy moments to speak of. Beautiful, real, touching and funny tales about Motherhood told cleverly and with great empathy made this play something that any woman could relate to, mother or not. I did find myself thinking it wasn’t a piece of theatre I would want to see with my husband, but that I would want my husband to see it. Exploring that thought further made me realise that Joy, the writers, actors and crew had made me feel part of a secret, special club. I really felt close to each of the characters and I shared in their ‘womanly’ secrets, which is perhaps why I would have felt uncomfortable for my husband to be seated beside me. It’s more like sitting down and having a heart to heart with your BFF. That being said, I don’t think husbands and fathers should be excluded from the audience by any means. There is a lot to be gained and learned by men seeing into this deep and sometimes troubling world of Motherhood, and would perhaps allow them to recognise signs in their own wives or partners that they may have missed before. Would I recommend that you see it? Certainly! Take your Mum; take your Grandmother, Aunt, Best Friend. Gather up a bunch of friends and take a plunge into the unpredictable, expectation shattering, joyous, heartbreaking, amusing world of ‘Mothers’. Above: Rowena McNicol as Catherine in Mothers. 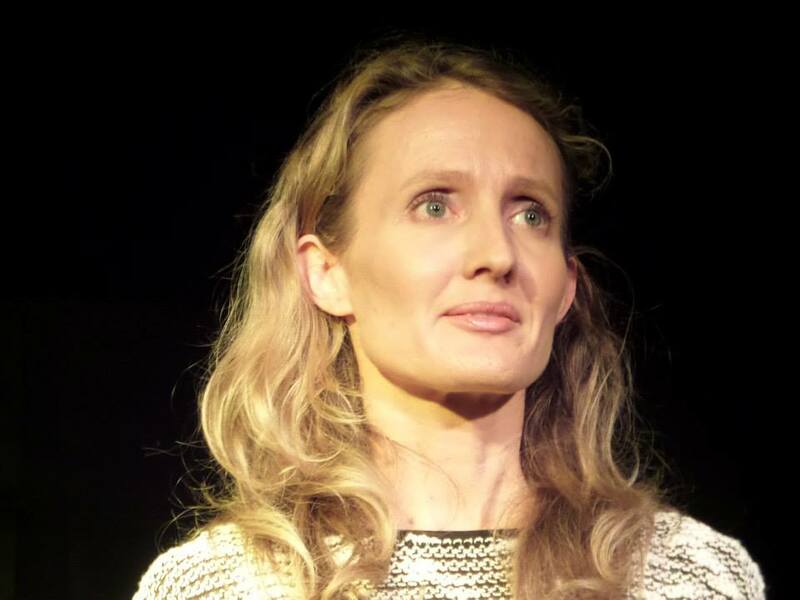 Catherine’s monologue For When She Comes is part of my full-length play The Journey – an intimate portrait of surrogacy, on the relationship between an intended parent and the surrogate she hires. Having swapped the corporate power heels for sneakers and trackies, Kathryn now homeschools her seven year old boy who has ADHD and Anxiety Disorder. While writing has always been a passion for her, it was something that took a back seat until being a mum tipped her life upside down, shook it violently and allowed all the dust and crap to fall out and float away! Now she shares all her day to day learning experiences at http://kathrynlowe.wordpress.com/. Kathryn is looking forward to digging into some of the misconceptions out there about special needs kids and how to parent them. Her goal in life at the moment is to get her son to a point where he can do work without wanting to hide under the armchair and raise awareness of the lack of real and useful support for kids with ADHD. there, nevertheless fondly recalls reading your take on breastfeeding for age-40-plus mums. She has just been in Melbourne visiting her family (widowed mum and Jen’s three married brothers), with her own son, James, aged 11. Thanks, Murray. That’s nice to know. It’s amazing how far flung we old Standard News journos are. If there was a Walkley for breastfeeding, I would have won it!